Ilda once again you've blown me away! These are just gorgeous! I can't decide which one I like more! Oh wow…two stunning creations. I love how you added the gold tips to the white version but both are equally beautiful. Oh my! I wish I had seen this a week (ok, maybe 2) before Christmas! I love it - especially the red ones - so bright, cheerful and "Christmas-y". I have to save this one to work on for next Christmas! so beautiful! WOW!!! That could stay on my wall ALL YEAR. Great job! Really pretty! But your concept is timeless - it might be too late for poinsettias, but any other flower would look fabulous, too. I'm thinking daisies and rosebuds for spring, gerbera daisies for summer, sunflowers for fall and then bam, we're right back to the pretty poinsettias. Thank you for the inspiration! 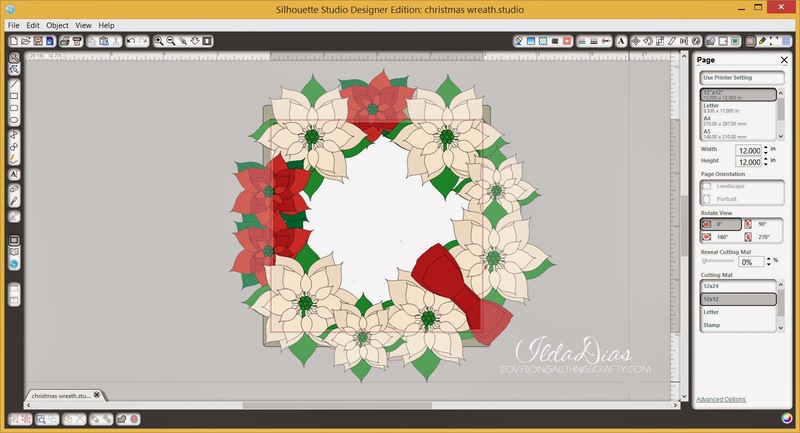 I love all your proyects... and for so I have already blought SVG cristmas poinsetia..
Now I have this on my siluette but I dont know how I have separeted the files... for working with the wreath..
As you can see my english is awful..sorry, I am from Spain. First thing you need to do is open up each layer for the poinsettia. Then all I did was piece all the layers together on top of each other. Then grouped the 3 layers. Once they are grouped I then sized the poinsettia to as big or as small as I wanted it. Once you are happy with the size of the poinsettia, ungroup it and cut. It is not necessary to do it like I did above. I only did that so that I could visualize the finished wreath. Hope that this helps you! Your English is very good!